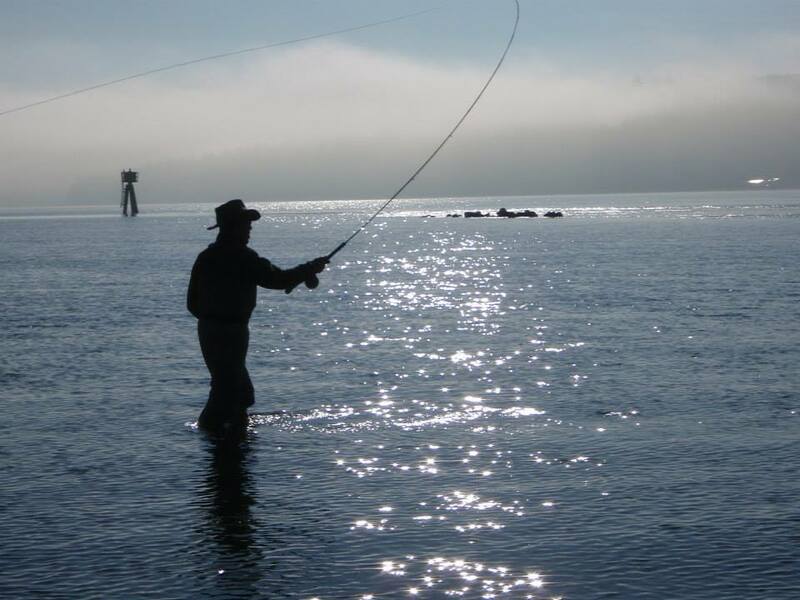 Winter sea-run Cutthroat fly fishing on Puget Sound. For the last few days around here the winds have been blowing a gale much of the time. The waters on the bay have been marl grey colored, and raging, on and off. Big waves came ashore like an invading legion, one phalanx after another came crushing onto the beaches, white foam and spume blowing up onto the rocky shores, and forty knot gusts. On days like that you wonder when you will be able to fish here again. It was like that last night, and we had trees down, power outages, etc. But by this morning is was as calm as could be, a bluebird day. The water was greenish blue, and clear as gin. The saltchuck waters clean up, sometimes within a few hours at most, after the big wind storms die down here. And we can get many mild, fishing friendly weather breaks between storms. This afternoon I drove down to the beach to check things out. I knew I wouldn't be fishing. I have been taking it easy after a bad cold knocked me out for a while. It was so nice out. There was a guy fishing out there, in the shallow water. He was dressed appropriately for the winter fishing game- like an Eskimo. The water is cold now. And when the winds get blowing, you'd better be dressed for it. I was feeling pangs of withdrawal, watching this fellow wading and casting, the water so flat, the sun shining. But in the distance I could see a squall, making its way down from the mountains, and I rolled up my window to shut out the cold air rushing along with it. Within minutes the rain was blowing down hard, the sky darkened. There was sleet in the mix, hammering at my windshield as I drove to town for coffee. In a few minutes it was clear and sunny again, and the waters calmed. Everything had that fresh sparkle to it. There was a nice rainbow arched over town as I drove in. That's the way it is here now. We play it by ear. But we can fish all winter. Here's an essay on winter sea-run cutthroat trout fishing that I originally wrote a few years ago, for a local Trout Unlimited group. I hope that you like it. The most relaxing way to fish for sea-run cutthroat. I am guiding fly fishers on the Olympic Peninsula beaches, rivers and streams. We walk and wade, or row along the shorelines in the dory, fly fishing for sea-run Coastal Cutthroat trout in freshwater and saltwater, and in the rivers for Cutthroat trout and summer and fall steelhead. This is all strictly catch and release, traditional, barbless single hook, fly fishing only. Lunch, snacks, soft beverages, and use of some equipment is included. I also offer personalized and private fly fishing and fly casting instruction for beginners through advanced casters. I would be happy to help you plan your Olympic Peninsula fly fishing adventure, for all levels of ability, beginner to expert. 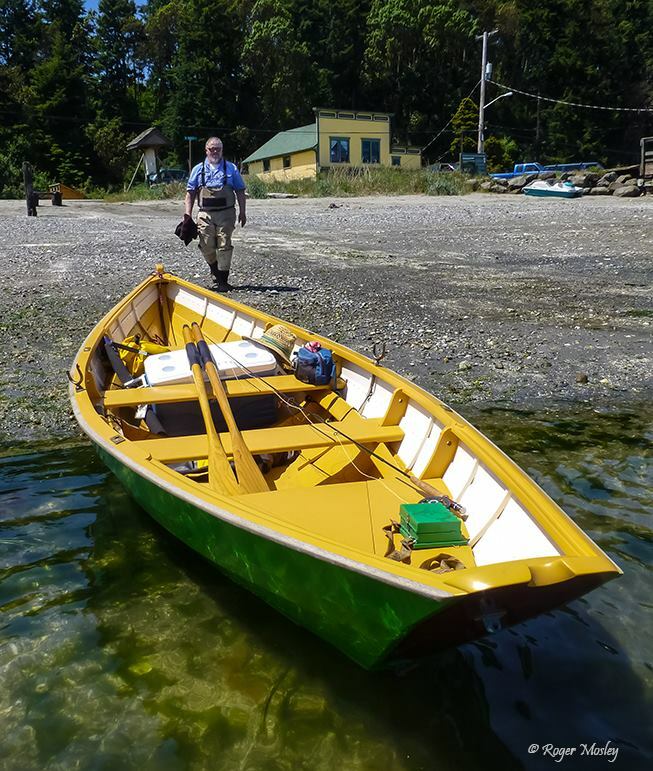 Public presentations, Naturalist Guide, rowboat picnics, tide pool and river trail day trips. Please call, write or email for booking details. Booking on short notice in the fall and winter is welcome.